"They want to control those sheep, don't they?" 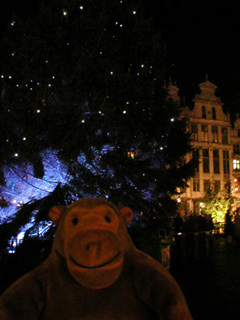 Mr Monkey scampered into the Grand Place from the south east, and found that there were Christmas decorations he hadn't studied before. 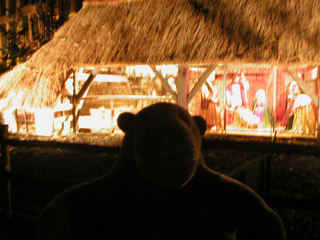 There was a tall fir tree, and a very large manger scene, with life size figures and real live sheep. There was a bit of fence keeping the sheep in place, so that they couldn't nibble anyone.